Eight years ago we bought an Optimist, elderly, new-painted, surveyed by my wife's cousin who had long been a sailor. That is to say, he had met his wife in a sailing club when he was 21. Well she wasn't his wife when he met her of course, that followed - oh shut up Richard. - Anyway the thing is, the paintwork is now in need of repair and on scraping, a total of nine fractures appeared, plus one I knew about and had already reinforced. 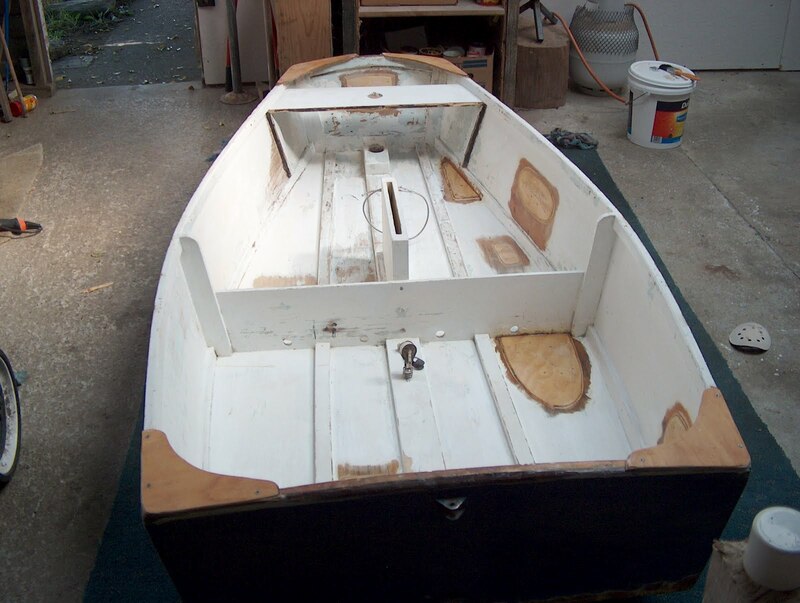 Elsewhere the woodwork was sound, and given that the boat was built (by calculation based on serial number) in 1963 I was impressed. I phoned the chap from whom we bought it to find out more of its history but he didn't return my calls. I have since done more scraping and found that wherever the paint came off easily he had used that well-known undercoat, Dirt. It had been slapped straight on, concealing rock impact damage from our amateur boat surveyor. The greater surprise was how well the paint had stuck to a dirty surface, and after a thorough sanding some of it even now remains under my ministrations. Iain Oughtred's book had said, surprisingly, that a boat hire company had found their plywood boats outlasted their fibreglass boats. But I'm not surprised any more. Apart from where the plywood edges were exposed to water, it's absolutely solid. Marine ply isn't available locally but the woodyard assured me that CD external grade ply is glued with the same waterproof glue. The locals build boats with ordinary building plywood, rummaging through the stacks for sound sheets of the stuff. I am nervous of reinforcements because of what Seppings said - "partial strength produces general weakness" so I limited myself to 4mm thick ply, feathered off at the edges, and a patch of fibreglass on the outside of the hull. I hate mixing epoxy resin. It means endless pairs of rubber gloves. Peeling them off for just a small smear of hardener goes against the Miserly Principle. The face mask is horrible and you have to wear one because I think the filler is powdered glass. I had to nick some syringes out of the surgery at dawn, and even then the place was heaving with receptionists. Gits. Why can't they all be late when I want to burgle the supplies cupboard? The glue lasts about 20 minutes before it's unusable, so there were lots of mixes and lots of syringes. Glassing the daggerboard slot was fun. - The glass went everywhere until I hit on the idea of putting a sheet of polythene over it, and pushing some folded sheets of closed cell foam into the slot, which worked perfectly. In the evening we had the new medical students to dinner and one of them admitted that she was 'quite good' at windsurfing, and I asked her "Does that mean you won the National Championships or something?" and she giggled and said "in 2006". Which she did. So I asked more, and she said she wanted to try kite surfing because the boards are tiny and the kite just needs inflating and then you're ready to go. Kite surfing meant it was much easier to take the gear - a sailboard is big and has to be lugged up onto the roof of a car, whereas the kiteboard is small enough to go in the back. She also said it was easier than windsurfing. She told me you could go at about 25 knots, windsurfing. She'd learnt sailing as a child, and windsurfing was an extension of it. All of which insights delighted me, though she did make me feel very pathetic and insignificant, a hideous old man learning to sail in a child's dinghy. - She was the same age as our daughter.